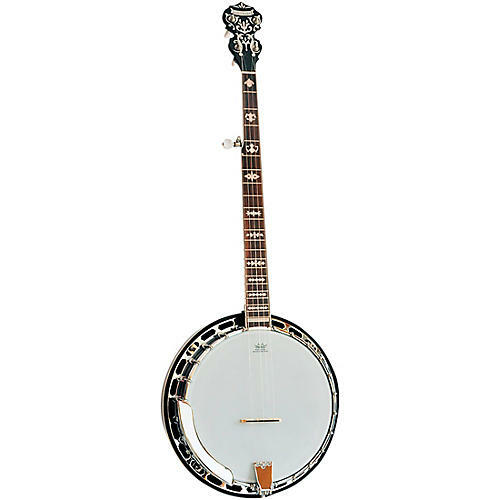 The Morgan Monroe MB-9 Duelington Deluxe is MM's top-of-the-line banjo. The Duelington combines aesthetic beauty with precision craftsmanship for a world-class banjo that is truly a pleasure to see, hear and own. From the mother of pearl inlay on a dark ebony fingerboard to the gorgeous flamed resonator, to the spectacular headstock design, this instrument really stands out from the crowd. A 3-ply maple rim and bell brass tone ring brings a tone that sounds like home. Every detail of this instrument is carefully designed and built. The tone rings, rim, peg heads, tailpiece, every aspect large or small reflects care and precision, and the result is a great-sounding instrument that will last a lifetime.